Optimus G Pro has features an expansive screen with a comfortable one-hand, bold patterned appearance, and lightweight body the perfect blend of tablet efficiency with smartphone convenience. 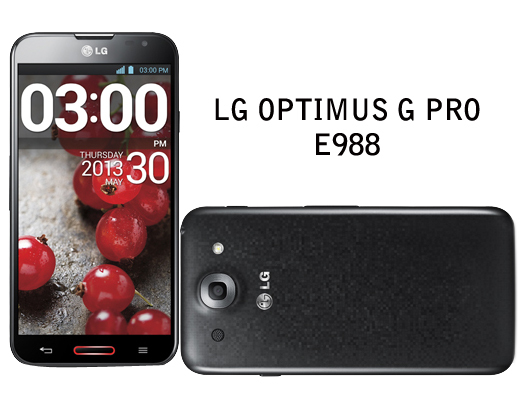 Optimus G Pro’s 5.5" Full HD IPS Display with 16:9 cinema-like viewing and 400 ppi provides superior graphics, accurate colors, sharp text, and dazzling images, delivering an overall extraordinary experience without over saturation or eyestrain. Capture amazing and vibrant pictures through Optimus G Pro’s 13 MP Full HD rear-facing camera, producing such detailed and sharp imagery, that clarity is retained even when zoomed in. In addition, the front-facing 2.1 MP Full HD camera is perfect for video chats or self-portraits. One thing that have this phone is the ability to record/capture a video using the rear and front camera at the same time. You can also pause and resume the recording to cut the unwanted footage. It's also have a auto focus camera. Qualcomm® Snapdragon™ Processor with 1.7GHZ Quad-Core CPU lends outstanding performance for process-intensive apps or games, fast web browsing, and seamless connectivity all without sacrificing battery life. The four cores offer an overall CPU performance that manage and run multiple apps smoother like a jelly in your hand. QREMOTE Infrared (IR) Technology will turn your smartphone into a universal remote control, able to operate many different home entertainment systems such as the TV, cable set-top-box, audio system, DVD or Blu-ray player, projector, or air conditioner. And with its new and improved version, QRemote, you can use the keyboard on your phone to control the cursor on your screen.